"The far northeast is disproportionately represented in the farmer’s market scene. There's probably 40 markets going on in the city and most of them are within ten miles of each other in Center City, South and West Philly," he says. "The closest market to me is still eight miles away, and people just won’t travel that far. I really wanted to start a market close to where I live." Bergman applied for a grant from PA Department of Agriculture, arguing that in Northeast Philadelphia many of the redemption rates for people receiving WIC (Women, Infants, Children) checks has been very low. "The biggest part of the reason I applied for the grant was to give people in this area a place to redeem their vouchers," he asserts. After a career change four years ago from an office manager to a farm market manager, first at The Food Trust, and now at Farm To City, he felt strongly that an active, available farm market could help solve this issue while strengthening his community. He was awarded the grant, and after months of planning, the Parkwood Farmer’s Market is slated to open on Saturday, May 18. Ben happily reports that there has been an overwhelmingly supportive response from the community. The market’s Facebook page, has already garnered over 500 fans, the 3rd Reform Presbyterian Church has donated their parking lot at 3024 Byberry Road for the market to take place, and the market’s logo (pictured) was designed by a local graphic designer, John Suter. The market will feature fresh, local produce from Taproot Farm and The McCanns Farm, and baked goods from Wild Flour Bakery. 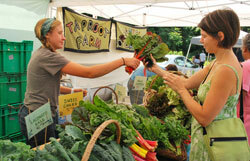 The market will run from 10 a.m. to 2 p.m., this and every Saturday throughout the summer. Check out the Parkwood Farmer’s Market blog for more information. EMILY KOVACH writes about food, beer and other delicious things in Philadelphia.